Welcome To ColleenRichman.com: Some Exciting News From Annmarie Skin Care! Some Exciting News From Annmarie Skin Care! 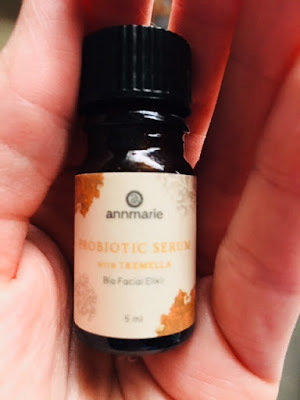 Introducing Our Newest Annmarie Skin Care Product - Probiotic Serum with Tremella: Bio Facial Elixir! Our new Probiotic Serum with Tremella supports your skin's natural defenses with a concentrated blend of skin-reviving probiotics. Olive leaf extract and astaxanthin work to shield skin from harmful elements with superior antioxidant activity. Tremella, an ancient Chinese beautifying mushroom, is nature's alternative to hyaluronic acid, immersing skin with deep hydration. Restorative herbs work together with biome-friendly extracts, to bring skin back to a state of balance. Hydrates. Restores. Calms Sensitive Skin. I received a sample size bottle and let me tell you it's amazing! I have dry skin, especially in the colder winters. This was great for helping me with that! My skin felt smoother over all and not flaky/dry like before. It's simple to use, extremely soft feeling and has no chemical smell because it's derived from natural ingredients. Be sure to head over to an amazing website that they offer, browse through all their products and choose something that's right for you! Pampering yourself has never been easier!